The Montavilla/East Tabor Business Association (METBA) is pleased to announce that its 7th annual street fair will occur on Sunday, July 29th in Downtown Montavilla from 10 a.m. to 5 p.m.
Once again, fair organizers have secured permits from the city of Portland to close down SE Stark Street between 76th and 82nd Avenues for the event. The Montavilla Street Fair is a family-friendly community celebration. In 2017, organizers estimated that 13,000 people attended the Montavilla Street Fair making it one of the largest street fairs in all of Portland and the single largest one-day event in East County. 15,000 are expected this year. Organizers anticipate that over 150 vendors will be present at the event selling food and drink, art, hand crafts, clothing, as well as marketing local products and services. As in previous years, the event corresponds with the Montavilla Farmer’s Market, adding an additional layer of fun and activity. Tandem events – a flea market, art showcase, and music afterparty are being organized by partner groups adding to the diversity of event options. The full music line up including performance times can be found at Montavilla.Biz. Confirmed acts include Micah & Me (micahandmerocks.com). Fair-goers can find day-of-event updates on Facebook and Instagram at #Montavilla Street Fair and #Go Local Montavilla. Attendees are encouraged to post their photos about the day’s goings-on! 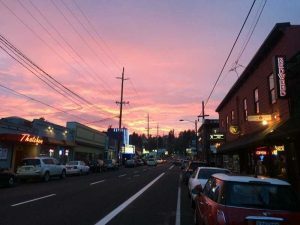 The Montavilla/East Tabor Business Association is a 501c6 non-profit with the mission to develop and enhance the economic viability of Montavilla and to promote the interests of businesses within the Montavilla Business District. The following information was provided by Venture Portland. Write a letter, call Commissioners or attend a Budget Hearing to let City Council know how your feel and what, if anything, you want in exchange for paying increased taxes. Letter writing best practices and City Council contact information are attached for your reference. Please cc: me on any emails sent to City Council and let me know if you plan to attend one of the hearings. Neighbors Want to Know: When Will a Full-Service Grocer Arrive in Montavilla? There were 245 responses to the question: What good and services are missing in Montavilla? International Gourmet, neighbors must still travel outside of the ‘hood for their general shopping needs. If you have a business in mind that you’d like to see in Montavilla, recruit them! Download our 4-page guide to locating a business in Montavilla. already exist in Montavilla! Did you know that Montavilla already has the following types of businesses? view webpages for a wide variety of member businesses! Supervises staff and participates in formal supervisory meetings; provides ongoing additional supervisory support as needed via phone, email, etc. Manages incoming inquiries via mail, email, etc. A passion for reaching goals and strategizing growth. Compensation: $5,000 for 6-month contract (extension possible; contingent on performance of the director and the association). 1-2 monthly meetings with board members required. Join your friends and neighbors to celebrate the winter holidays in Historic Downtown Montavilla (SE Stark Street from 76th to 82nd). The fun begins on Friday, December 9th with the 4th Annual Merry Montavilla Soiree Business Crawl! The celebration continues on Saturday, December 10 when Santa visits Wix Insurance. The Fest winds up Friday, December 18 with a free showing of Elf at Academy Theater. Throughout Frosty Fest, businesses will be competing in a window display competition. Full schedule and details are below. Click here to vote for you favorite Downtown Montavilla Holiday Window Display. Stop by Wix Insurance to visit Santa and enjoy cocoa and crafts. The Montavilla/East Tabor Business Association will hold its annual elections for board members at the 2016 annual meeting on October 11th, 2016 at Ya Hala Restaurant from 6:00 p.m. to 8:00 p.m. The current METBA board will have up to nine available board slots. 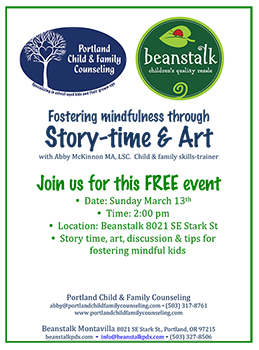 Portland Child & Family Counseling and Beanstalk children’s resale shop teaming up for a fun, family event. Beanstalk Montavilla on Sunday, March 13th at 2:00 p.m.
for fostering mindfulness through story-time & art. Abby will be reading, “The Cow That Went Oink” at Beanstalk’s beautiful, new Montavilla location—8021 SE Stark—and leading a kid and adult friendly discussion and art project around mindful decision making and social development. Abby is a former school counselor and current private practice skill-builder, supporting individual kids in reaching their happiest, best adjusted, confident and fulfilled selves as they grapple with anxiety, grief, and life transitions. For more information about Abby or to schedule a free consultation go to www.portlandchildfamilycounseling.com, call (503) 317-8761, or email abby@portlandchildfamilycounseling.com. For more information about Beanstalk and to see the latest selection of quality clothing, toys, shoes and gear, visit beanstalkpdx.com or call (503) 327-8506. We hope you can join us on Sunday, March 13th! This holiday season, Portland city and neighborhood leaders want shoppers to venture out beyond downtown and the central city. In fact, they hope people will cross the Great Divide, also known as 82nd Avenue. “We’re a small business town,” says Commissioner Nick Fish, who secured $100,000 to launch an East Portland pilot project this fall. 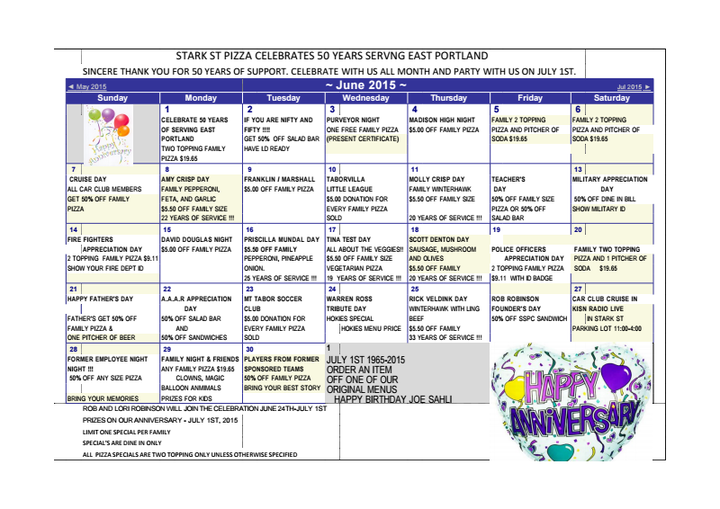 This June Stark Street Pizza is celebrating 50 years of serving East Portland!! Check out their calendar of events for specials all month long!